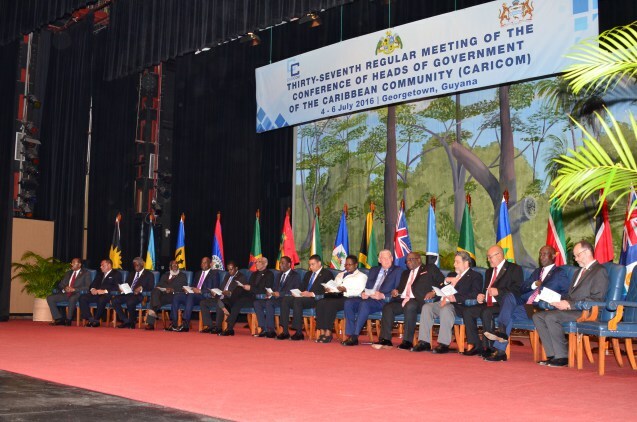 The Thirty-Seventh Regular Meeting of the Conference of Heads of Government of the Caribbean Community (CARICOM) was held at Georgetown, Guyana, on 4 - 6 July 2016. The Prime Minister of Dominica, the Honourable Roosevelt Skerrit, chaired the proceedings. Other members of the Conference in attendance were Prime Minister of Antigua and Barbuda, Honourable Gaston Browne; Prime Minister of The Bahamas, Rt. Honourable Perry Christie; Prime Minister of Barbados, Rt. Honourable Freundel Stuart; Prime Minister of Grenada, Dr. the Rt. Honourable Keith Mitchell; President of Guyana, His Excellency Brigadier (Ret) David Granger; Prime Minister of Jamaica, Most Honourable Andrew Holness; Prime Minister of St. Kitts and Nevis, Dr. the Honourable Timothy Harris; Prime Minister of Saint Lucia, Honourable Allen Chastanet; Prime Minister of St. Vincent and the Grenadines, Dr. the Honourable Ralph Gonsalves; President of Suriname, His Excellency Desiré Bouterse; and Prime Minister of Trinidad and Tobago, Dr. the Honourable Keith Rowley. Belize was represented by the Honourable Wilfred Elrington, Minister of Foreign Affairs. Haiti was represented by Prime Minister, His Excellency Enex Jean-Charles. Montserrat was represented by Hon. Delmaude Ryan, Deputy Premier and Minister of Education, Health and Community Services. The Associate Member in attendance was Turks and Caicos Islands represented by Mr Ronlee James, Head of Secretariat at Office of the Premier. The Opening Ceremony was addressed by the Secretary-General of the Caribbean Community (CARICOM) Ambassador Irwin LaRocque; Prime Minister of Jamaica, the Most Honourable Andrew Holness; Prime Minister of Saint Lucia, the Honourable Allen Chastanet; Prime Minister of St. Vincent and the Grenadines, Dr. the Honourable Ralph Gonsalves; the President of Suriname, His Excellency Desiré Bouterse; Prime Minister of Trinidad and Tobago, Dr. the Honourable Keith Rowley; and the Chairman of the Conference, the Prime Minister of Dominica, Honourable Roosevelt Skerrit. All the speakers paid tribute to the former Prime Minister of Trinidad and Tobago, Mr. Patrick Manning, who passed away on 2 July 2016, just prior to the Meeting of Conference. The President of Suriname His Excellency Desiré Bouterse called for swifter action on diversification of the regional economy. He proposed that the services industries be developed to the point where they became “solid foreign currency earners” characterised by sustainability. He urged Member States, particularly those dependent on the extractive sectors, to come together and brainstorm on solutions to the myriad challenges confronting them. The Prime Minister of Jamaica the Most Honourable Andrew Holness called for the movement of labour throughout the Caribbean Community to be made as easy as that of the movement of goods. Prime Minister Holness emphasised that for many, including the man in the street, freedom of movement represented a tangible benefit of regional integration. He also advised that Jamaica would be pursuing increased bilateral relationships with its CARICOM counterparts. The Prime Minister of Saint Lucia the Honourable Allen Chastanet said that the promise of regional integration is “slowly starting to put some flesh on our bones in some areas.” He added that policies and structures that were languishing needed to be reviewed so that new and more effective ones could be put in place. He challenged the Region not to be afraid to do more as it had already demonstrated its ability to punch above its weight in the international community. The Prime Minister of St. Vincent and the Grenadines Dr. the Honourable Ralph Gonsalves said that CARICOM needed to deepen the integration process. Further, he stressed the need to acknowledge the achievements and “see how we can build on them rather than beating up on ourselves needlessly.” He warned against pessimism and a learned helplessness. Notwithstanding all the challenges of regionalism, Prime Minister Gonsalves reaffirmed the primacy of completing the CARICOM Single Market and Economy for continued progress in the Region. The Prime Minister of Trinidad and Tobago, Dr the Honourable Keith Rowley affirmed the importance of CARICOM to his country. He pledged to continue the legacy of former Trinidadian Prime Minister, the late Patrick Manning, whom he described as “a Caribbean man who was committed to excellence and to the Caribbean Community. He pointed out that security was central to the economy, well-being, progress and quality of life of the Community. Chairman of the Conference, the Prime Minister of Dominica Honourable Roosevelt Skerrit reminded the audience that CARICOM was a primary community built on empathy and caring for each other. He said that at the individual level this is continuously being reinforced, whenever or wherever people interact. The Prime Minister called on all to work together to strengthen cooperation and collaboration so as to create a stronger, more vibrant community. “Let us therefore focus more closely on what needs to be done to strengthen CARICOM, to make it more economically competitive and generate resources to sustain our togetherness. Our resilience is being tested more than before, but we have proven time and again that we are strong”. the Chairman said. Heads of Government of the Caribbean Community expressed their deep sadness at the passing of the former Prime Minister of Trinidad and Tobago, Mr Patrick Manning, who died on Saturday 2 July 2016 just prior to the Meeting of Conference. Mr. Manning displayed the finest qualities of regionalism and had an unswerving commitment to building his country and the wider CARICOM. His progressive ideas for strengthening the regional integration movement led to many initiatives which redounded to the enhancement of the sense and spirit of community among our Member States. Mr Manning’s genuine desire to create a more equitable Community led to such initiatives as the Petroleum Stabilisation Fund which he established as a facility to provide Member States with financial assistance. This was a tangible demonstration of goodwill to and solidarity with Member States faced with high oil prices from which his country benefitted. His view of Trinidad and Tobago’s role in CARICOM went beyond the financial as he routinely rendered unselfish and immediate support to Member States in times of natural disasters. As Lead Prime Minister for Security in the CARICOM quasi-cabinet, he oversaw the security arrangements for the Cricket World Cup 2007 and his proposals led to the formation of the CARICOM Task Force on Crime and Security. The implementation of its recommendations improved the nature and quality of co-operation in that area leading to the establishment of very important agencies and institutions which continue to serve and protect the Community’s security interests. It also resulted in Security Co-operation being adopted as the fourth pillar of our integration movement. Mr Manning’s deep concern about the ravages of Chronic Non-Communicable Diseases, as highlighted by the Region’s experts, led to the historic regional summit on the issue. As we approach the 10th Anniversary of the Port-of-Spain Declaration on NCDs, we recall that his vision of the dangers posed by these scourges spurred the Community to be at the forefront of a successful proposal for a United Nations High Level Meeting on NCDs. His humanity and personal interest in the well-being of others were outstanding attributes of his character and were highly appreciated by all, both within and outside the Community. His invaluable contribution to our Community stemmed from his conviction that integration was the most viable option for the sustainable development of our small states and the improvement of the lives of our people. Trinidad and Tobago and the Caribbean Community have lost a truly remarkable person and statesman whose legacy of committed service to country and Region left an indelible mark on the history of this Region and will remain a treasured memory. In light of the continued threats to the Region’s security, Heads of Government agreed on ways to deepen and strengthen co-operation in this area. In that regard, they approved a review of the CARICOM Crime and Security Strategy (CCSS). They emphasised the importance of aligning national security plans to the CCSS in order to avoid duplication in intervention support. Heads of Government also stressed the important role IMPACS continued to play in the Community’s effort to address crime and security and reaffirmed their commitment to strengthen the Institution. Heads of Government agreed that urgent steps should be taken for completion of a number of critical regional security agreements. They prioritised the completion of the CARICOM Arrest Warrant Treaty, an essential instrument to address cross-border crime. They agreed that this Treaty should be finalised before the end of the current year. Heads of Government received an update on the status of the CSME and agreed that a comprehensive review would be considered at the Inter-Sessional Meeting next February. They also agreed that there should be an intensified public education campaign in Member States aimed at all levels of the society. The education programme should highlight the benefits and provisions of the CSME. Heads of Government received an update on the work of the CARICOM Commission on the Economy which focussed on fiscal sustainability, private sector stimulation, business regulatory environment, transitioning to sustainable growth and resource mobilisation. Heads of Government also approved continuing initiatives in these areas. Heads of Government received a report of the economic performance of Member States in 2015 which showed mixed results. They noted the technical support given by the Caribbean Development Bank (CDB), Caribbean Export, Inter-American Development Bank (IDB), and the United Nations Economic Commission for Latin America (UNECLAC) to the work of the Commission. Heads of Government reaffirmed their commitment to the implementation of all elements of the CSME regime. Heads of Government discussed the issue of facilitation of travel. They noted that the overwhelming majority of travelling citizens were moving throughout the Community without hindrance. They however urged Member States to comply with the relevant decisions taken by the Community and the rulings of the Caribbean Court of Justice and take all appropriate measures to give full effect to the free movement regimes. They reaffirmed the principle that persons were to be treated with dignity at ports of entry. Heads of Government mandated the CARICOM Secretariat to convene a meeting of Chief Immigration Officers, CARICOM Ambassadors, and other relevant officials by 30 September 2016, in order to address the challenges being experienced by Community nationals travelling throughout the Region. Heads of Government reminded Member States to submit statistics annually to the Secretariat on the refusals of entry and the operation of the free movement regimes and that these statistics must be submitted by 31 January of the following year. Heads of Government reviewed the latest developments with respect to efforts to resolve the issue of de-risking severely affecting Member States. They emphasised that correspondent banking was an important global public good and the current de-risking strategy was discriminatory and counterintuitive to good public policy. 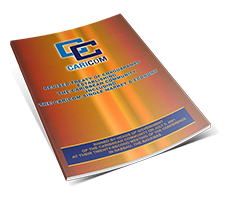 They re-iterated that CARICOM’s trade, economic welfare and the transfer of remittances were gravely affected by the de-risking strategies of foreign banks. In expressing concern that there was little progress on resolving the issue, Heads of Government agreed that CARICOM would continue its robust and unrelenting advocacy on the issue and that the Committee of Ministers of Finance on Correspondent Banking should maintain the current high level engagement. Heads of Government also agreed to host a Global Stakeholder Conference on the Impact of the Withdrawal of Correspondent Banking on the Region which would include banks and regulators from the region, the United States of America, Canada and Europe, international development partners and representatives from civil society. Heads of Government received a presentation on the Draft Roadmap for the Single ICT space and agreed that their Ministers responsible for ICT would meet in September, 2016, in order to make appropriate recommendations to the Conference. Heads of Government received an update on the most recent developments on the Belize – Guatemala border dispute and agreed to issue a statement which is attached to this Communiqué. Heads of Government received an update on the most recent developments between Guyana and Venezuela on the border controversy and agreed to issue a statement which is attached to this Communiqué. Heads of Government decided to reconstitute the Prime Ministerial Sub-Committee on Cricket with the Prime Minister of St Vincent and the Grenadines, as the Chairman. They agreed that the other members would be the Prime Minister of Barbados and the Prime Minister of Jamaica. Membership of the Sub-Committee will be open ended as is the case with all CARICOM Prime Ministerial Sub-Committees. The Committee will address all matters related to West Indies cricket including those that were being addressed by the Cricket Governance Committee. Heads of Government expressed appreciation to the Prime Minister of Grenada, Dr the Honourable Keith Mitchell, for his untiring efforts in furtherance of the development of West Indies cricket. Heads of Government endorsed the importance of statistics to the Region’s efforts to attain sustainable development, continuous improvement in the standard of living, empowerment of Community nationals, governance, planning and policy making and progress towards the CSME. Heads of Government considered and endorsed the Action Plan which among other things seeks to strengthen national statistical systems. The Plan enables the upgrading of the Information and Communications Technology infrastructure and provides overall support to human resource development. Heads of Government also agreed that the UN Secretary General should be advised that with regard to the statistical work carried out by the United Nations statistical system, the Community should be viewed as a distinct grouping within the Latin America and Caribbean area. They viewed this distinction as fundamental as it was based on the unique challenges that are faced particularly by Small Island Developing and low lying coastal States (SIDS) which constitute this grouping. As the Tenth Anniversary of the historic Port of Spain Declaration “Uniting to fight the Non-Communicable Diseases (NCDs) draws near, the Heads of Government recognised the progress made in addressing the issue. They acknowledged, however, that progress was variable and agreed to adopt a more holistic approach. In this regard, they pledged to address issues such as the banning of smoking in public places; trade related measures; banning advertisement of potentially harmful foods which specifically target children; and elevating taxes on foods high in sugar, salt and trans-fats. Heads of Government endorsed the ECGECW initiative intended to address key sexual and reproductive health concerns of girls and women in the Caribbean. The objectives of ECGECW are to reduce teenage pregnancy, prevent cervical cancer, and eliminate Mother to Child Transmission of HIV. Heads of Government noted the 2016 UN Political Declaration on Ending AIDS: On the Fast-Track to Accelerate the Fight against HIV and to End the AIDS Epidemic by 2030. Recognising the contraction of external funding to support the regional response to HIV and AIDS, Heads of Government committed to taking collective advocacy to fill remaining gaps in funding to support ending the AIDS epidemic in the Region. In their continuing efforts to reform the operations of the Community as agreed in the Strategic Plan, Heads of Government considered and adopted the Draft Rules of Procedure for Meetings of the Conference. Heads of Government were briefed about the recent political developments in Suriname by His Excellency, the President of Suriname Desiré Bouterse, in relation to a ruling by the Military Court of 9 June 2016, whereby the legislative powers in the Republic of Suriname were affected. Heads of Government were informed about the decision of the Government of Suriname to apply Article 148 of the Constitution of Suriname, whereby the Public Prosecutor was ordered to cease the legal procedure in a particular case so as to allow the constitutionally legal mechanisms to fulfil their tasks in an orderly manner. Heads of Government noted the information provided by the President of Suriname and expressed their view that the matter was an internal one. Heads of Government recalled the Community’s longstanding relationship with Cuba and recognised the need to seize the trade, business and investment opportunities, including those in tourism, presented by the evolving situation in Cuba. Heads of Government agreed that every effort will be made to conclude negotiations for a Second Protocol to the Trade and Economic Cooperation Agreement to allow for signature before the end of 2016. Heads of Government reiterated their call for the lifting of the USA trade and economic embargo against Cuba. Heads of Government reiterated their deep concern about the human rights situation of Dominicans of Haitian descent rendered stateless by the Constitutional Court ruling on nationality. They agreed to continue the Region’s advocacy in international fora and bilateral meetings to alleviate the plight of these persons some of whom have been deported to a country with which they have no links. Heads of Government also expressed concern over the humanitarian situation of Haitian migrants deported from the Dominican Republic and other Haitian returnees. Heads of Government further agreed to engage directly, as appropriate, with the Dominican Republic on the matter of statelessness and the required remedies. Heads of Government welcomed the visit of Her Excellency President Michelle Bachelet of Chile. They noted the visit symbolised the renewal of longstanding political and cooperation relations with a country which has been long supportive of the Community through its institution and capacity building projects in a wide diversity of areas. The two parties observed that they share common interests and concerns. These include the importance of economic growth as a means to equitable and sustainable development, poverty eradication, the adverse impact of climate change, and the need for resources to address the resulting burdens, vulnerability to disasters, and protection of the seas. Heads of Government were of the view that strengthening the relationship between CARICOM and Chile was of mutual interest. To this end, it was proposed to bolster the framework for political dialogue and to pursue further projects of South-South cooperation as well as trade and investment links. Heads of Government agreed to heighten political engagement and expand technical co-operation to include Climate Change, the Sustainable Development Goals and trade co-operation. Heads of Government viewed Britain’s exit (Brexit) from the European Union (EU) as a watershed event in in current world affairs whose geopolitical and geo-economic repercussions would be far-reaching and long-lasting. They received a detailed brief on the political, diplomatic, trade, economic and financial implications of Brexit for the Region as well as recommendations for addressing them. Heads of Government agreed that CARICOM should continue to monitor developments as the exit process unfolded and underlined the importance of a common and structured approach that married the technical, political and diplomatic. Heads of Government emphasised that the United Kingdom and the European Union remain strong and valued partners of the Community. The Twenty-Eighth Intersessional Meeting of the Conference of Heads of Government of the Caribbean Community will be held on a date to be announced in February 2017 in Guyana. Heads of Government expressed their full support for the Government of Belize as it enters the process of dialogue and welcomed the decisions of the Government of Belize and Guatemala to engage in the design and development of a mechanism of cooperation for the Sarstoon River, which marks Belize’s southern boundary. They urged them to complete this at the earliest opportunity. Heads of Government expressed support the continuous and critical role of the Organisation of American States (OAS) in the process aimed at resolving the dispute arising from Guatemala’s claims and further calls on the international community to continue supporting the OAS office in the Adjacency Zone. The Conference of Heads of Government also supports the efforts of Belize and Guatemala to move deliberately to fully implement the special agreement of 2008 between Belize and Guatemala to submit Guatemala’s territorial, insular and maritime claims to the International Court of Justice. The Heads of Government emphasised their unflinching support for the sovereignty, territorial integrity and security of Belize. Heads of Government received a report on recent development in the relations between Guyana and Venezuela. They also received a report on the current efforts of the SG of the United Nations proposing a way forward to the two countries towards a decisive end to the controversy. Heads of Government noted with appreciation that the SG of the United Nations attaches the highest priority to finding a solution to the controversy which arose out of Venezuela’s contention that the Arbitral award of 1899 which definitively settled the land boundary between Guyana and Venezuela is null and void. In that regard they signalled their full confidence in the Secretary-General to exercise urgently his authority under the 1966 Geneva Agreement for a choice of options that would bring the controversy to a definitive and judicial conclusion that would be beneficial not only to Guyana but the Caribbean Community as a whole. Heads of Government reiterated their full support for the sovereignty and territorial integrity of all CARICOM States and their entitlement to rights regarding maritime zones under international law.